Piedmontese Hazelnuts for sale. Buy online at Zingerman's Mail Order. Gourmet Gifts. Food Gifts. Grown north of the town of Asti, the Italian home of our Hazelnut Torrone Nougat. This is the prime hazelnut producing area in Italy, and the place where a couple hundred years ago somebody first came up with the idea of mixing hazelnuts into chocolate. But luckily they save a few hazelnuts back so we can enjoy 'em on their own. These hazelnuts are harvested by hand, skinned and roasted to intensify their flavor. Slightly sweet, not a bit bitter, easy to devour by the handful. 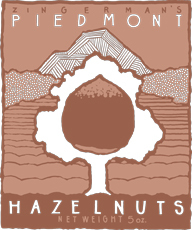 "I thought I had had some good hazelnuts in the past, but the Piedmont hazelnuts are a cut above all others! Every hazelnut out of the bag was perfect in appearance, right amount of crunchiness, and light sweetness! Yum! Awesome quality control."